Drivers are the heart of any LED system. 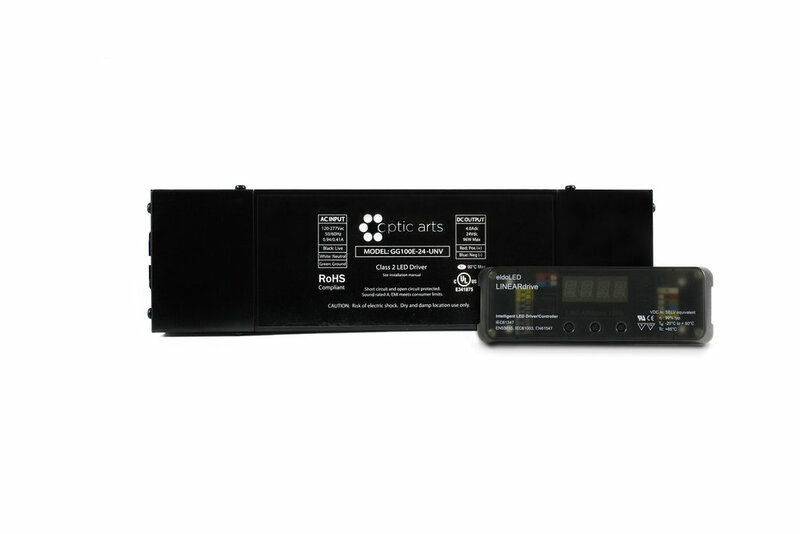 They convert line voltage to low voltage and provide dimming and color mixing functionalities. We offer both dimmable and non-dimmable drivers. For dimming, we offer MLV (line voltage dimmable), 0-10v and DMX controlled drivers and modules. Feel free to give us a call if you have any questions about LED controls; we're happy to help. Installing our 0-10V MODULE inside the Optic Arts Non-Dim Electronic Driver makes the driver dimmable on 0-10V control systems. Our NON-DIM ELECTRONIC DRIVERS are rated for interior and damp location use, feature universal AC input voltage (120-277VAC) and are UL listed. Our MLV DIMMABLE DRIVERS are rated for interior and damp location use. They are available in 120VAC and 277VAC versions and they are all UL or ETL listed. PURE DC™ DRIVERS have an integrated circuit that regulates the DC output creating an amazing dim curve all the way to 0.1% on most dimming systems. Our DMX SYSTEM uses proven technology by eldoLED® to dim down to 0.1% on most systems. The HI-LUME® A-SERIES is available in 2-Wire Forward Phase and 3-Wire/Ecosystem versions and dims down to 1% on compatible Lutron controls. The HI-LUME® PREMIER is dimmable using either 3-Wire or Ecosystem controls and dims down to 0.1% or compatible Lutron controls. The CTRLDMX.4CH.3S.W is a single zone DMX controller with three scene memory and an RGB/RGBW color picker for use with color changing FLEX DC products. VintageDim® 2 is a dim-to-warm and variable white system that enables true dim-to-warm with custom curves on one 0-10V control circuit, or CCT and Intensity control on two 0-10V control circuits. All modes and features can be factory programmed but can also be programmed in the field using the accompanying smart phone application. Programming is achieved via NFC wireless technology.